When you visit a city, you often look for genuinely unique items to bring back home. 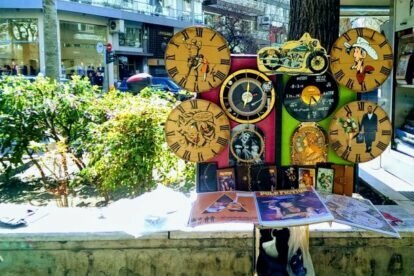 In Thessaloniki you can buy such things from wandering craftsmen who park in different areas of the city in order to display their art inventories. My favorite street artists are those situated in the corner of Palaion Patron Germanou with Tsimiski street, in the heart of the city’s shopping area. Although there are a few benches there, and they change in rotation, you can find things like wall clocks with scenes or characters from beloved movies, leather cases, wire jewellery or notebooks with specially painted covers. I like the spontaneity of buying from someone that has crafted their own merchandise. Even though there is a relatively small variety of things to choose from, I can feel the dedication and ‘meraki’ (in Greek it means work done with creativity, diligence and whole-heartedness) people have put into for turning their art into products. For me at least, art deserves to be accessible everywhere and not chiefly in galleries and glass boxes.